I work in IT and there comes a time, when you need to know which serial number is used for programs which are installed on computers. In general knowing serial number is not important as companies have global contracts and use the same number on all deployments. Most common use for knowing exact serial number is for re-activating specific software after system refresh. Home users on the other hand, have a sticker with a product key for Windows 7 somewhere on the computer. Sticker can be found on the bottom side of a laptop computer or hidden behind the battery. Workstations have sticker usually on the side or at the top. On the other hand, you may use programs that are not labeled with a sticker on a computer. If you lose a license number of programs you have installed you may run in to problems after a system crash or system upgrade. If you reinstall a computer you have to activate programs again. 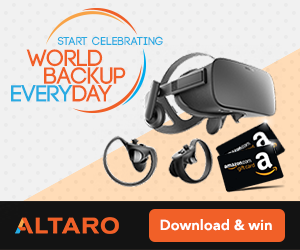 If you don’t have a serial number you will have to contact the vendor and one of the problems is that you will lose time, sometimes even 24 hours. In some cases, vendor could stop supporting you version or the program and this may complicate things a bit. Some of the programs where it’s good to have a copy of serial number are: Adobe CS – CS 6 suite or separate Adobe programs like Adobe Photoshop, Adobe Illustrator, MS Office, VMware Workstation, MS Sql Server, Winamp, Magic ISO, Borland Delphi, Anti-Malware from Malwarebytes. Yes, you could lose serial number of Games as well. You won’t be able to find a license key if you go to Help menu. While it’s the most logical step to check About option in the program, in most cases activation information won’t be listed. 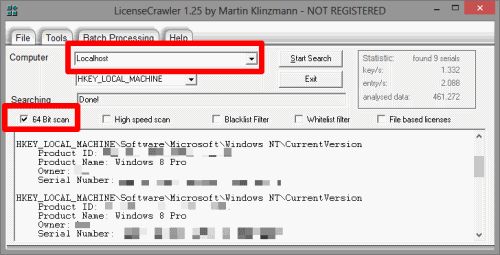 There are several programs that can reveal Windows 7 serial key or MS Office serial number including the most popular applications. 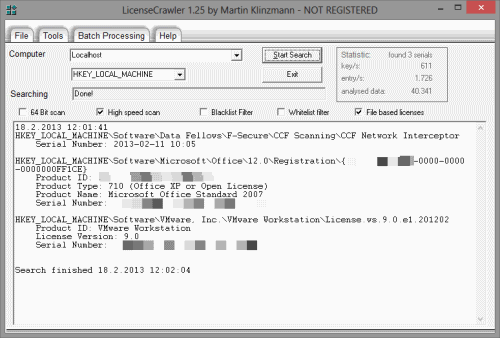 LicenseCrawler is a free program which can help you extract licensing information of your programs. 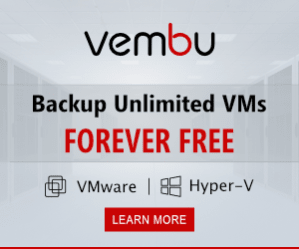 It supports many programs, including Windows, Office, VMware and even Adobe programs. It can find serials on both 32 bit systems and 64 bit systems. You can search on your local computer or even remote computers. But what do you do if you need to find serials on multiple computers? No problem, program has a batch mode. Just select computers and it will find serial numbers. In the early days it had some detection problems of Adobe programs, but now the author solved most of them. Jelly Bean Keyfinder is available in two versions, free which is limited by the detection of the programs and commercial, which has support for finding information from more than 6500 programs. 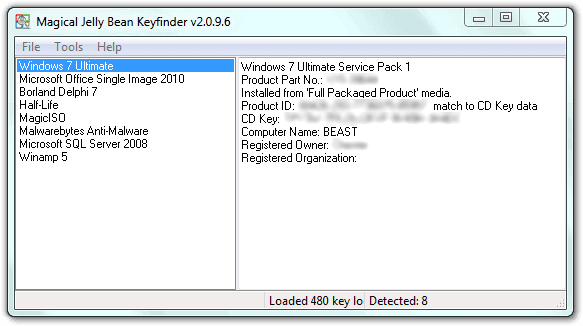 You can easily find Windows 7 serial key and can restore even Half-life information. It’s the first program I used for backing up program information. Price for premium version is $29.95. In return you will get one of the best programs on the market. You are able to scan a non-bootable computer which is great if you use a program where you can’t contact company (for example company went out of business). 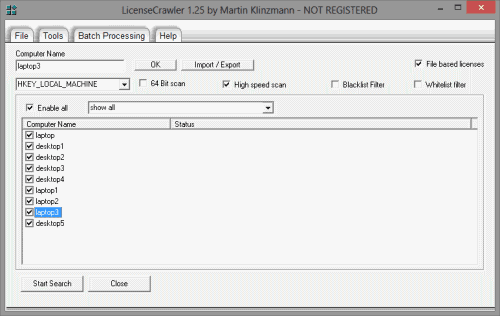 Just like LicenseCrawler it works on 64 bit computers. Another addition to a premium edition is a portable USB version. You can export information to a TXT or CSV in a free version. In a premium version export is extended to HTML, Word, Excel, XML and even PDF.